There are numerous lefse recipes in Norway and around the world. Here you'll find one that contains potatoes all the way from "the old country". special lefse baking utensils especially around Christmas time. But if you are some of the lucky ones, my mom will be serve you delicious lefse through-out the year, not only at Christmas. Lefse is easy to make and is an appreciated treat for many Norwegians. I will keep on adding traditional Norwegian recipes, so stop in often. 6-7 medium potatoes, cooked & peeled. 2-1/2 to 3 cups flour. Drain boiled potatoes; mash and gradually add butter, salt, milk and sugar. Whip well untilfluffy. Chill mixture in refrigerator. Gradually add 1/2-cup flour and mix well. Add enough of remaining flour to form soft dough. Place onto lightly floured surface. Divide into 30 pieces of dough. Roll into 6" round discs. Place the rolled out discs in middle of a hot, dry griddle. Bake until light golden. Turn and bake on other side. Place on clean, dry dish or paper towel and cool. You can bake them without a griddle. Use a large iron frying pan instead. easier to roll out and handle. One way to serve this traditional Norsk delicacy is to spread it with softened butter and sprinkle with sugar and cinnamon and make a roll. Cut the roll in the center at an angle and serve. Lefse can also be filled with favorite sandwich meats and cheeses. Pop it in the Foreman Grill for a few minutes until the cheese melts. In Norway we also eat lefse with thinly sliced brunost (sweet Norwegian goat cheese/Gjeitost). This soft, thin bread is ideal to make delicious appetizers. All you have to do is fill; roll and cut it at an angle. Thenyou can add garnish by sticking a toothpick with an olive or a cherry tomato with a sprig of parsley through it. Voila, you'll have beautiful appetizers. Only imagination is our limit. When the Norwegians in the Minnesota serve Lutefisk, there will also be potato lefse on table. Yum-Yum. Hope you will enjoy this Lefse Recipe.Happy Baking! 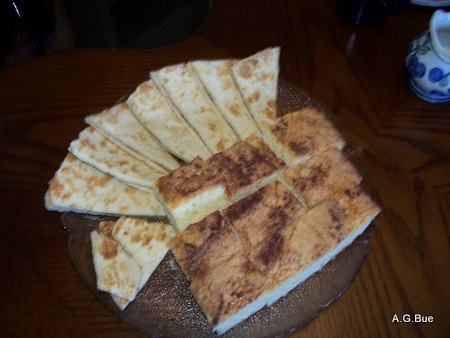 Norwegian Recipes after Potato Lefse Recipe.